Guy Debord, as founding and pivotal figure of the Situationist International, pursued one of the twentieth century’s most arch and exciting assaults on modern life. His 1967 Society of the Spectacle (followed, twenty years later, by Comments on the Society of the Spectacle) was a fierce critique of late-capitalist culture and became the signal text for those involved in the political events of May 1968 and beyond. 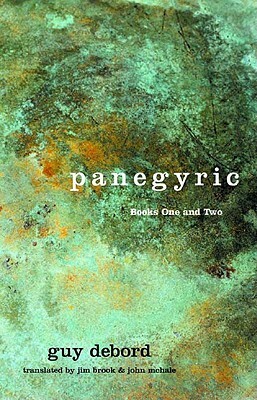 Panegyric is Debord’s audacious autobiography, and here for the first time in English is the second, beautifully illustrated volume published together with the spare and classical text of the first. A rare combination of poetry and precision, it tells of something even rarer: a life that refused to adjust to the dominant malignancies of its time. Guy Debord was born in Paris in 1931 and committed suicide in 1994. A Marxist theorist, French writer, poet, filmmaker, hypergraphist and founding member of the groups Letterist International and Situationist International, Debord is best known as the leading theoretician of the situationist movement. His works translated into English include "The Society of the Spectacle," "Comments on the Society of the Spectacle," and "Panegyric."